If your computer is still able to connect to the internet, we may be able to help you quickly and efficiently, without you having to leave your home or office. To get started, simply start a remote chat session from the left side of the screen. An engineer will ask you for a description of your problem and request that you authorize them to access your machine remotely. Once he is connected, he will be able to diagnose your problem and get working on it while you relax and go on with your day. Once the problem is fixed, we will notify you and give you an opportunity to provide feedback about your experience. It is that easy! Not sure we can fix your computer remotely? Give us a try, you may be surprised. 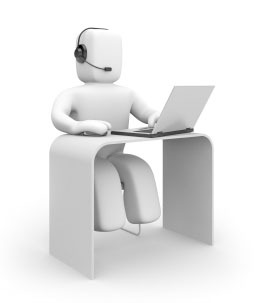 We have 98% success in our remote support sessions and you will save some money as well. But if we fail to fix the problem, or we find that a closer look is required, we will send out an engineer to your site or ask you to ship or drop off the machine to us. We only charge you for fixing the problem, so an unsuccessful remote support session is always free. To get started, click on the Live Chat button on the left.